Down Syndrome (DS) shows an increased risk of chronic diseases, associated to higher morbidity and mortality for cardiovascular disease. Some studies have shown a worse lipid profile in children with DS, however, until now there is no recommendation for screening for dyslipidemia in these subjects. Objective: To describe the frequency of dyslipidemia in a population of Chilean children and adolescents with DS. Patients and Method: Retrospective study, including patients with DS, aged 2 to 18 years, who participated in a special health care program for people with DS in Health Net UC CHRISTUS, between 2007 and 2015. Patients who had a lipid profile between their routine laboratory tests were included. Clinical characteristics, relevant comorbidities, malformations, medications, nutritional status and pubertal development were obtained from medical records. Diagnosis of dyslipidemia was considered according to the criteria of the NHLBI 2011. Results: The medical records of 218 children with DS were revised, 58,3% had some type of dyslipidemia. The most frequent single dyslipidemias were low HDL Chol (15,1%) and hypertriglyceridemia (12,8%). Atherogenic dyslipidemia (low HDL plus hypertriglyceridemia) was the most frequent combined dyslipidemia (13,3%). The occurrence of atherogenic dyslipidemia was not associated with overnutrition and obesity. Conclusions: A high frequency of dyslipidemia was found in Chilean children and adolescents with DS. Our results make us suggest that lipid profile should be performed early in all patients with DS, independent of the presence of risk factors for dyslipidemia. Down syndrome (DS) is the most frequent viable chromosomopathy worldwide, with a reported prevalence between 1 in 691 live births in the United States1 to 1 in 400 live births in Chile2. People with DS have an increased risk of chronic diseases, such as overweight, obesity and dyslipidemias, which confer an increased risk of cardiovascular disease (CVD). While some authors have reported a low incidence of atherosclerotic lesions in adults with DS, possibly reducing the risk of coronary events3, other reports show that these patients have an approximately four times higher risk of death by ischemic heart disease and stroke in adulthood than the general population4. Due to advances in prevention, diagnosis and management of chronic diseases, people with DS have a longer life expectancy, increasing survival from 9 years in the first reports5 to over 60 years nowadays6. The above-mentioned advances and the exposure to new environmental factors mean that the actual cardiovascular risk of these patients is currently unknown. An assertive diagnosis of dyslipidemias allows an early treatment, which mainly consists of lifestyle changes, including modifying dietary and exercise habits. In case of non-response to this first stage, drug therapy should be considered7,8. Nowadays, there are few studies that describe the lipid profile of population with DS, most of them are case-control studies with small sample size, and many of them in adults9,10. Studies conducted in pediatric population show higher rates of dyslipidemia in children with DS compared with the general pediatric population11, suggesting that this condition would be independent from nutritional status12. Previous reports on lipid profile among patients with DS show variable results, being high levels of triglycerides (TG) and low levels of high-density cholesterol particles (HDL-C) the most frequent findings9-11,13. However, to date, there is no proper description of lipid profile in children with DS, and if this contributes to a higher risk of CVD is still controversial. The objective of this study is to determine the frequency of dyslipidemias and to describe the lipid profile in a Chilean population of children and adolescents with DS at risk of dyslipidemia. Cross-sectional study including patients with DS between the ages of 2 and 18 years, who participated in a special care program for people with DS in UC CHRISTUS Health Network, between 2007 and 2015. Patients with DS who had a lipid profile (LP) among their routine laboratory tests. The decision of measuring LP was made by their physician, based on the presence of known risk factors of dyslipidemia, such as dyslipidemia family history, overweight or hypothyroidism (all the tests were routinely performed on an empty stomach). The worst LP available on the patient’s clinical record was selected. First, considering the number of plasma lipids out of range, and second, the magnitude of the deviation from the normal range. Two researchers reviewed the clinical records and collected the relevant information at the moment of measuring LP. The following characteristics were registered: epidemiological characteristics (age, gender), family history of dyslipidemia and early CVD (reported by parents), relevant comorbidities (hypothyroidism, diabetes mellitus, celiac disease) malformations (hemodynamically significant congenital heart defects and gastrointestinal malformations), medication related to dyslipidemias development (e.g. risperidone and chemotherapy), nutritional status and puberal development. The diagnosis of dyslipidemias was made according to National Heart Lung and Blood Institute (NHLBI) criteria14: Total Cholesterol (TC) ≥ 200 mg/dl, Non High Density Lipoprotein Cholesterol (Non-HDL-Chol) ≥ 145 mg/dl, Low-Density Lipoprotein Cholesterol (LDL Chol) ≥ 130 mg/dl, High-Density Lipoprotein Cholesterol (HDL Chol) ≤ 40 mg/dl, Triglycerides (TG) ≥ 100 mg/dl (2-9 years) and ≥ 130 mg/dl (10-18 years). 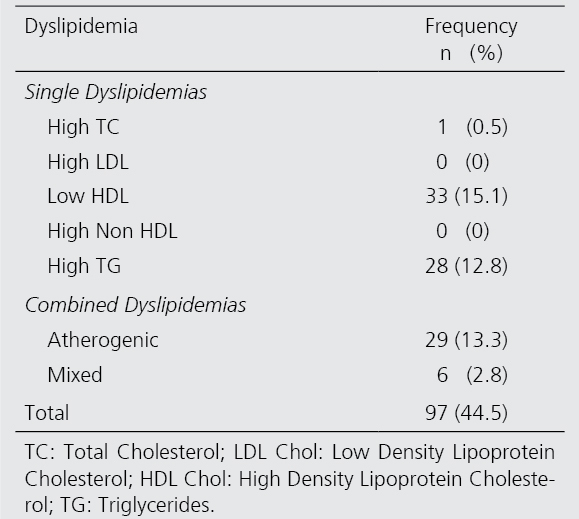 Dyslipidemias were classified as a) Single Dyslipidemia, when only one of the five lipids of the profile was abnormal, b) Combined Dyslipidemia: b1) Atherogenic Dyslipidemia (AD) when high TG and low HDL Chol were found, with TC and LDL Chol in normal range; b2) Mixed Dyslipidemia when TC and/or LDL Chol were high, with high TG and normal HDL Chol15. Nutritional diagnosis criteria are summarized in Table 116,17. The diagnosis of short stature was considered for all ages, as Height/Age growth chart < p3, according to the growth charts for DS17. Dyslipidemia family history was considered as any dyslipidemia in parents or siblings, and early CVD was considered as the presence of acute myocardial infarction, treated angina, coronary heart disease interventions, stroke or sudden heart disease in father or brother before 55 years of age, or in mother or sister before 65 years of age. This study was approved by the Research Ethics Committee of the School of Medicine, Pontificia Universidad Católica de Chile (registration code # 14-064). Due to the retrospective nature of the study, a waiver of consent was approved. The categorical variables were described in terms of number and percentage, and numeric variables in terms of median and range. For AD, the crude association (non-dyslipidemia vs. AD) was analyzed with the following variables: gender (male vs. female), age (median and range), hypothyroidism (yes vs. no), dyslipidemia family history (yes vs. no) and nutritional diagnostic (normal weight or undernutrition vs. overweight or obesity) using Fisher’s exact test. Calculations were performed with SPSS 22.0 software. All p-values < 0.05 were considered statistically significant. Clinical records of 218 children and adolescents with DS were examined. Clinical characteristics of the study group are detailed in Table 2. 58% of patients (N = 127) had at least one plasma lipid out of range. The frequency of each dyslipidemia is described in Figure 1. The most frequently found dyslipidemia was low HDL Chol (15.1%), followed by AD (13.3%). 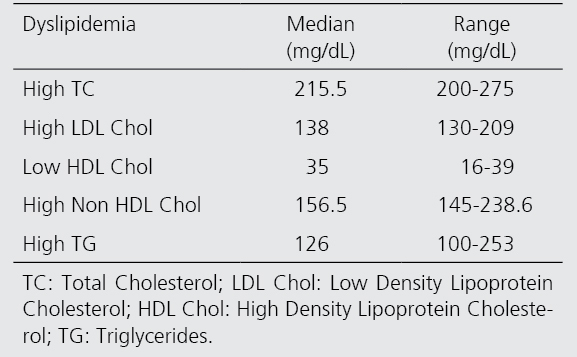 Table 3 shows the values of each plasma lipid (median and range) in the group with dyslipidemia. Figure 1. Frequency of each type of dyslipidemia. The most frequent type of dyslipidemia was low HDL Cholesterol, followed by hypertriglyceridemia. TC: Total Cholesterol; LDL Chol: Low Density Lipoprotein Cholesterol; HDL Chol: High Density Lipoprotein Cholesterol; TG: Triglycerides. Among the patients with dyslipidemia, only 49% (N = 62) had one plasma lipid out of range (single dyslipidemia), 26% had two, 13% had three, 9% had four, and 3% of the study population had all five plasma lipids out of range. Within the group of patients with combined dyslipidemia, the most frequent combination was low HDL Chol and high TG. Table 4 details the frequency of single and combined dyslipidemia. The group of AD patients was compared with the group without dyslipidemia, analyzing by age, gender, nutritional status, hypothyroidism, dyslipidemia family history and early CVD. When assessing by age, patients with AD were younger than healthy patients (3.91 years vs. 5.08 years, p-value = 0.006). No gender differences were observed. In patients with hypothyroidism, there was a trend towards a higher frequency of AD compared to patients without hypothyroidism, although this difference was not statistically significant (28.6% vs. 13.9%, p = 0.105). When analyzing by family history, no significant differences were observed. In relation to nutritional status, the group with overweight and obesity did not have a trend towards a higher frequency of AD. A high frequency of dyslipidemia, near to 60%, was found in our study group. This frequency is much higher than the reported in general pediatric population, which varies between 15 and 30%15,18-20. In the single and combined dyslipidemias analysis, our results showed similar trends to previous reports9,10,15 in which low HDL Chol, high TG, and AD were the most frequent types of dyslipidemia. Regarding to the clinic characteristics of our study group, there were higher rates of hypothyroidism (76.1%) than previous reports with rates between 17 and 35% in children with DS21,22. This finding could be explained by the fact that our study group was selected among patients with dyslipidemia risk factors. It is remarkable in our study that the presence of each type of dyslipidemia was not related to nutritional status, resembling the results obtained by Adelekan et al., where children with DS had a less favorable LP than their siblings regardless of nutritional status12. As a matter of fact, in our study, the frequency of overweight and obesity is relatively low (21.1%), probably due to a strict medical follow-up. On the other hand, it could be proposed that dyslipidemias are related to some genetic factor which influences cholesterol metabolism, rather than healthy habits such as diet and exercise. We decided to use single or combined dyslipidemias classification, due to its well described clinical characteristics. Pure hypertriglyceridemia is often related to obesity, high visceral adiposity, insulin resistance and other metabolic complications8, which are common in people with DS12. Moreover, low HDL Chol is usually due to central obesity and it is related to physical inactivity and diets low in monounsaturated fats. In some cases, although uncommon, it is related to familiar patterns23-25. It would be interesting to have more information about the dietary habits of our study group, although medical recommendations generally include a healthy diet. The high frequency of hypertriglyceridemia and low HDL Chol findings are concerning, due to their association with metabolic syndrome26,27 and CVD28. In addition, AD in childhood is predictive of accelerated atherosclerosis and early cardiovascular events in adulthood7. The American Academy of Pediatrics, in agreement with the panel of experts of NHLBI (14), recommends the dyslipidemias universal screening, with a first LP performed in prepubertal stage (9-11 years) and a second LP between 17-21 years. However, this approach is still controversial, since multiple entities8,29-31 recommend to carry out a selective screening only in high-risk groups. It is remarkable that the condition of DS has not been considered as an independent risk factor of CVD32. Furthermore, to this date, clinical guidelines for health supervision in DS33,34 do not include screening for dyslipidemias among their recommendations. For this reason, it is important to carry out new studies controlled by comorbidities and risk factors, in order to evaluate the performance of screening for dyslipidemias in this population and to consider possible preventive treatments for CVD. Our results are similar to those previously reported. First, among the strengths of our study, to our knowledge, this is the largest cohort (n = 218) that evaluates this issue. Secondly, it reports the lipid profile of an exclusively pediatric population with DS, while previous studies are mainly focused on adults. Thirdly, the use of NHLBI’s dyslipidemia definitions allows a proper comparison of our results with previous publications. Additionally, the dyslipidemia classification, such as single or combined, allows to analyze the direct clinical implications of each one. On the other hand, there are some limitations. First, the retrospective nature of the analysis confers a higher risk of selection bias. The fact that our study group was selected from patients with risk factors of dyslipidemia, from a single health center, does not necessarily validate the results for the general population with DS. However, due to the high prevalence of DS in our health center, and to the fact that UC CHRISTUS Health Network is a reference center in our country, we consider that our sample is acceptable. Nevertheless, new prospective studies are needed to confirm these results. Our findings suggest that DS itself confers a higher risk of dyslipidemias, independently from the presence of comorbidities typically related to an abnormal LP, such as overweight, obesity, and hypothyroidism. It could be expected that this is related to a genetic cause, a special form of lipid metabolism11,35 or other related conditions to DS which have not been studied so far. Although the studied population corresponds to a biased sample, the high frequency of dyslipidemia, compared to general pediatric population and the development of dyslipidemia at early ages, suggest the need for early clinical awareness in this group. This study provides insights for new research lines in this population, such as the exploration of dyslipidemias in all patients with this genetic condition. In addition, long-term surveillance of these patients would be essential to assess the frequency of dyslipidemia independent from the presence of associated risk factors, and to correlate dyslipidemia and CVD, in order to clarify the risk of coronary heart disease in adults with DS. On the other hand, prospective studies would allow the development of general screening recommendations and interventions for this group. In conclusion, our study suggests that dyslipidemia screening should be performed early in all patients with DS, and that the condition of DS should be considered as an independent risk factor of developing dyslipidemia. 1. Parker SE, Mai CT, Canfield MA, et al. Updated national birth prevalence estimates for selected birth defects in the United States, 2004-2006. Birth Defects Res Part A-Clin Mol Teratol. 2010;88(12):1008-16. 2. Nazer HJ, Cifuentes OL. [Prevalence of congenital malformations at birth in Chilean maternity hospitals]. Rev Med Chile [Internet]. 2014;142(9):1150-6. Available from: http://www.ncbi.nlm.nih.gov/pubmed/25517055 [Consultado el 16 de octubre de 2016]. 3. Sobey CG, Judkins CP, Sundararajan V, Phan TG, Drummond GR, Srikanth VK. Risk of Major Cardiovascular Events in People with Down Syndrome. PLoS One [Internet]. 2015;10(9):e0137093. Available from: http://www.ncbi.nlm.nih.gov/pubmed/26421620 [Consultado el 16 de octubre de 2016]. 4. Hill DA, Gridley G, Cnattingius S, et al. Mortality and cancer incidence among individuals with Down syndrome. Arch Intern Med [Internet]. 2003;163(6):705-11. Available from: http://www.ncbi.nlm.nih.gov/pubmed/12639204 [Consultado el 16 de octubre de 2016]. 5. Penrose LS. The incidence of mongolism in the general population. J Ment Sci [Internet]. 1949;95(400):685-8. Available from: http://www.ncbi.nlm.nih.gov/pubmed/18148788 [Consultado el 16 de octubre de 2016]. 6. Glasson EJ, Sullivan SG, Hussain R, Petterson BA, Montgomery PD, Bittles AH. The changing survival profile of people with Down’s syndrome: implications for genetic counselling. Clin Genet [Internet]. 2002;62(5):390-3. Available from: http://www.ncbi.nlm.nih.gov/pubmed/12431254 [Consultado el 16 de octubre de 2016]. 7. Kavey REW. 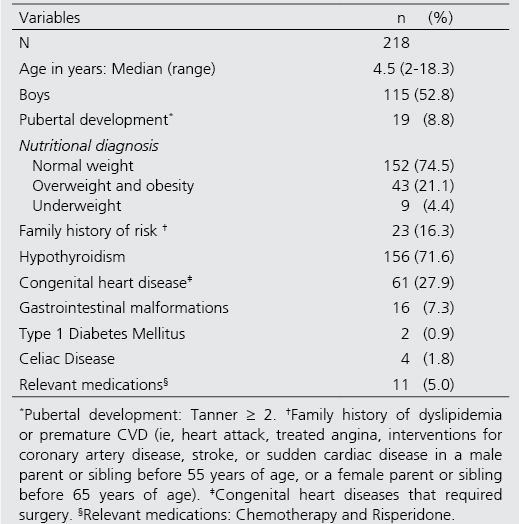 Combined dyslipidemia in childhood. J Clin Lipidol. Elsevier Inc; 2015;9(5):S41-56. 8. Barja S, Cordero ML, Baeza C, Hodgson MI. Diagnóstico y tratamiento de las dislipidemias en niños y adolescentes. Rev Chil pediatría. 2014;85(3):367-77. 9. Nishida Y, Akaoka I, Nishizawa T, Maruki M, Maruki K. Hyperlipidaemia in patients with Down’s syndrome. Atherosclerosis [Internet]. 1977;26(3):369-72. Available from: http://www.ncbi.nlm.nih.gov/pubmed/139898 [Consultado el 16 de octubre de 2016]. 10. Salo MK, Solakivi-Jaakkola T, Kivimäki T, Nikkari T. Plasma lipids and lipoproteins in Down’s syndrome. Scand J Clin Lab Invest [Internet]. 1979;39(5):485-90. Available from: http://www.ncbi.nlm.nih.gov/pubmed/160610 [Consultado el 16 de octubre de 2016]. 11. Zamorano A, Guzmán M, Aspillaga M, Avendaño A, Gatica M. [Concentrations of serum lipids in children with Down’s syndrome]. Arch Biol Med Exp (Santiago) [Internet]. 1991;24(1):49-55. Available from: http://www.ncbi.nlm.nih.gov/pubmed/1845017 [Consultado el 16 de octubre de 2016]. 12. Adelekan T, Magge S, Shults J, Stallings V, Stettler N. Lipid profiles of children with Down syndrome compared with their siblings. Pediatrics [Internet]. 2012;129(6):e1382-7. Available from: http://www.ncbi.nlm.nih.gov/pubmed/22585768 [Consultado el 16 de octubre de 2016]. 13. Pueschel SM, Craig WY, Haddow JE. Lipids and lipoproteins in persons with Down’s syndrome. J Intellect Disabil Res [Internet]. 1992;36 ( Pt 4):365-9. Available from: http://www.ncbi.nlm.nih.gov/pubmed/1388078 [Consultado el 16 de octubre de 2016]. 14. Expert Panel on Integrated Guidelines for Cardiovascular Health and Risk Reduction in Children and Adolescents, National Heart, Lung, and Blood Institute. Expert panel on integrated guidelines for cardiovascular health and risk reduction in children and adolescents: summary report. Pediatrics [Internet]. 2011;S213-56. Available from: http://www.ncbi.nlm.nih.gov/pubmed/22084329 [Consultado el 16 de octubre de 2016]. 15. Barja Yáñez S, Arnaiz Gómez P, Villarroel Del Pino L, et al. Dyslipidemias in School-Age Chilean Children: Prevalence and Associated Factors. Nutr Hosp [Internet]. 2015;31(5):2079-87. Available from: http://www.ncbi.nlm.nih.gov/pubmed/25929377 [Consultado el 16 de octubre de 2016]. 17. Pastor X, Quintó L, Corretger JM, Gassió R, Hernández M, Serés A. Tablas de crecimiento actualizadas de los niños españoles con síndrome de Down. Rev Medica Int Sobre El Sindr Down. 2004;8(3):34-46. 18. Kit BK, Kuklina E, Carroll MD, Ostchega Y, Freedman DS, Ogden CL. Prevalence of and trends in dyslipidemia and blood pressure among US children and adolescents, 1999-2012. JAMA Pediatr [Internet]. 2015;169(3):272-9. Available from: http://www.ncbi.nlm.nih.gov/pubmed/25599372 [Consultado el 16 de octubre de 2016]. 19. Burrows AR, Leiva BL, Weistaub G, et al. [Prevalence of metabolic syndrome in a sample of Chilean children consulting in an obesity clinic]. Rev Med Chile [Internet]. 2007;135(2):174-81. Available from: http://www.ncbi.nlm.nih.gov/pubmed/17406734 [Consultado el 16 de octubre de 2016]. 20. Barja S, Acevedo M, Arnaiz P, et al. [Early markers for atherosclerosis and metabolic syndrome in children]. Rev Med Chile [Internet]. 2009;137(4):522-30. Available from: http://www.ncbi.nlm.nih.gov/pubmed/19623418 [Consultado el 16 de octubre de 2016]. 21. Karlsson B, Gustafsson J, Hedov G, Ivarsson SA, Annerén G. Thyroid dysfunction in Down’s syndrome: relation to age and thyroid autoimmunity. Arch Dis Child [Internet]. 1998;79(3):242-5. Available from: http://www.ncbi.nlm.nih.gov/pubmed/9875020 [Consultado el 16 de octubre de 2016]. 22. Purdy IB, Singh N, Brown WL, Vangala S, Devaskar UP. Revisiting early hypothyroidism screening in infants with Down syndrome. J Perinatol [Internet]. 2014;34(12):936-40. Available from: http://www.ncbi.nlm.nih.gov/pubmed/24945161 [Consultado el 16 de octubre de 2016]. 23. de Ferranti SD. Childhood cholesterol disorders: the iceberg base or nondisease? Med Clin North Am [Internet]. 2012;96(1):141-54. Available from: http://www.ncbi.nlm.nih.gov/pubmed/22391258 [Consultado el 16 de octubre de 2016]. 24. Moschonis G, Mavrogianni C, Karatzi K, et al. Increased physical activity combined with more eating occasions is beneficial against dyslipidemias in children. The Healthy Growth Study. Eur J Nutr [Internet]. 2013;52(3):1135-44. Available from: http://www.ncbi.nlm.nih.gov/pubmed/22868822 [Consultado el 16 de octubre de 2016]. 25. Hoppu U, Isolauri E, Koskinen P, Laitinen K. Diet and blood lipids in 1-4 year-old children. Nutr Metab Cardiovasc Dis [Internet]. 2013;23(10):980-6. Available from: http://www.ncbi.nlm.nih.gov/pubmed/23182924 [Consultado el 16 de octubre de 2016]. 26. Kwiterovich PO. Recognition and management of dyslipidemia in children and adolescents. J Clin Endocrinol Metab [Internet]. 2008;93(11):4200-9. Available from: http://www.ncbi.nlm.nih.gov/pubmed/18697860 [Consultado el 16 de octubre de 2016]. 27. Zappalla FR, Gidding SS. Lipid management in children. Endocrinol Metab Clin North Am [Internet]. 2009;38(1):171-83. Available from: http://www.ncbi.nlm.nih.gov/pubmed/19217518 [Consultado el 16 de octubre de 2016]. 28. Quijada Z, Paoli M, Zerpa Y, et al. The triglyceride/HDL-cholesterol ratio as a marker of cardiovascular risk in obese children; association with traditional and emergent risk factors. Pediatr Diabetes [Internet]. 2008;9(5):464-71. Available from: http://www.ncbi.nlm.nih.gov/pubmed/18507788 [Consultado el 16 de octubre de 2016]. 29. Qureshi N, Humphries SE, Seed M, Rowlands P, Minhas R, NICE Guideline Development Group. Identification and management of familial hypercholesterolaemia: what does it mean to primary care? Br J Gen Pract [Internet]. 2009;59(567):773-6. Available from: http://www.ncbi.nlm.nih.gov/pubmed/19765358 [Consultado el 16 de octubre de 2016]. 30. Wiegman A, Gidding SS, Watts GF, et al. Familial hypercholesterolaemia in children and adolescents: gaining decades of life by optimizing detection and treatment. Eur Heart J [Internet]. 2015;36(36):2425-37. Available from: http://www.ncbi.nlm.nih.gov/pubmed/26009596 [Consultado el 16 de octubre de 2016]. 31. US Preventive Services Task Force, Bibbins-Domingo K, Grossman DC, Curry SJ, Davidson KW, Epling JW, et al. Screening for Lipid Disorders in Children and Adolescents: US Preventive Services Task Force Recommendation Statement. JAMA [Internet]. 2016;316(6):625-33. Available from: http://www.ncbi.nlm.nih.gov/pubmed/27532917 [Consultado el 16 de octubre de 2016]. 32. Kavey R-EW, Allada V, Daniels SR, et al. Cardiovascular Risk Reduction in High-Risk Pediatric Patients. Circulation. 2006;114(24). 33. Bull MJ, Committee on Genetics. Health Supervision for Children With Down Syndrome. Pediatrics [Internet]. 2011;128(2):393-406. Available from: http://pediatrics.aappublications.org/content/128/2/393%5Cnhttp://pediatrics.aappublications.org/content/128/2/393.full%5Cnhttp://pediatrics.aappublications.org/content/128/2/393.full.pdf%5Cnhttp://www.ncbi.nlm.nih.gov/pubmed/21788214 [Consultado el 16 de octubre de 2016]. 34. Lizama CM, Retamales MN, Mellado SC. [Recommendations for health care of people with Down syndrome from 0 to 18 years of age]. Rev Med Chile [Internet]. 2013;141(1):80-9. Available from: http://www.ncbi.nlm.nih.gov/pubmed/23732418 [Consultado el 16 de octubre de 2016]. 35. Tansley G, Holmes DT, Lütjohann D, Head E, Wellington CL. Sterol lipid metabolism in down syndrome revisited: down syndrome is associated with a selective reduction in serum brassicasterol levels. Curr Gerontol Geriatr Res [Internet]. 2012;2012:179318. Available from: http://www.ncbi.nlm.nih.gov/pubmed/22649448 [Consultado el 16 de octubre de 2016]. To Dr. Salesa Barja (Gastroenterology and Nutrition Department, Division de Pediatrics, School of Medicine, Pontificia Universidad Católica de Chile) for her critical contribution at analysis and interpretation of our results.